By using the hashtag #YesTravelTexas in response to a request from @TravelTexas, I hereby irrevocably and unconditionally grant to The Office of the Governor, Economic Development & Tourism, and those acting with its authority, including its clients, representatives, and agents, (hereinafter referred to collectively as "Travel Texas"), the unrestricted, absolute, perpetual, irrevocable worldwide right and license (the "License") to use my name, and without limitation, the text, image(s), and/or video(s) requested, to use, reproduce, copy, modify, edit, adapt, create derivative works of, display, perform, exhibit, print, distribute, communicate, transmit or broadcast, publicly or otherwise, or otherwise use and permit to be used the Content or any part thereof, whether alone or in combination with other materials (including but not limited to text, data, images, photographs, illustrations, graphics, and video or audio segments of any nature), in any media now known or later created, including promotional, marketing and advertising material, employee communications, customer and trade materials and other publications, websites and social media pages owned or operated by Travel Texas, and products or services offered by Travel Texas without further compensation, consideration, or notice to or permission from me or any third party. I waive any and all rights in such derivative works of the Content and any claims I may have based on rights of publicity, privacy or any other rights that may arise based on the use of the Content as provided in this Authorization, Release, and License (the "Agreement"). I acknowledge that, this License does not grant Travel Texas the right to sublicense or sell the Content as stock photography. All copyright and other intellectual property in the Content shall be retained by me. 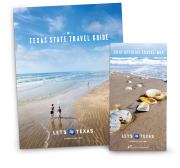 All copyright and other intellectual property in all collations and compilations of the Content made by Travel Texas shall vest in Travel Texas, subject to Travel Texas license to use the Content granted above. I understand that this License is granted to Travel Texas in consideration of the publicity given to the Content, and I acknowledge and agree that I will not be entitled to any compensation from such use at any time. Travel Texas at its sole discretion will have the right to attribute use of the Content to me based on the preferences and statements (or paraphrased, modified or abridged statements with different words with substantially the same meaning) that I have provided below. I understand and agree that this attribution may include Personally Identifiable Information such as my name, alias, or username. I hereby authorize Travel Texas to use my likeness and the likeness of any persons for whom I am the legal guardian, publicly or otherwise, as such likeness(es) may appear in the Content, in conjunction with the License. I understand and agree that a copy of all Content will become property of Travel Texas and will not be returned to me. I understand that Travel Texas will have no obligation to make any use of the Content and I do not have any right to inspect or approve the Content or Travel Texas&apos;s use of the Content. The Content does not infringe any third party proprietary rights, intellectual property rights, industrial property rights, personal or moral rights or any other rights, including without limitation, copyright, trademark, trade names, industrial designs, patent, trade secret, privacy, publicity or confidentiality obligations. I will defend, indemnify, and hold harmless Travel Texas from and against any damages, claims, or causes of action (including reasonable legal fees and costs) arising from or relating to any breach of the warranties I have made in this paragraph or any other obligations I have made in this Agreement. I hereby hold harmless and release and forever discharge Travel Texas from all claims, demands, and causes of action which I, my heirs, representatives, executors, administrators, or any other persons acting on my behalf or on behalf of my estate have or may have by reason of this Agreement, including without limitation, claims or liability for violation of personal or property rights, right of portrait, defamation, libel, false light, invasion of privacy, public disclosure of private facts, emotional distress or misappropriation. In consideration for the grant of this Agreement, Travel Texas agrees that within thirty (30) days following receipt of a request to revoke my consent to this license and cease use of the Content from me or any person whose likeness appears in the Content, Travel Texas will remove the Content from any Internet sites controlled by it, will cease use of the Content in future marketing endeavors, and optionally delete my personal data if desired. Requests may be submitted here: privacy.traveltexas@gov.texas.gov. I have reached the age of majority in my state, am considered an adult for purposes of entering into contracts, and I fully understand the contents, meaning, and impact of this Agreement.